So, I was looking through my Japanese and Korean books looking for creeper and double coin references and came across what looks like a creeper reference in "한국매듭" which I'll blog more about when I figure out how to type Korean (or I could do what I did to get this book title onto the computer which is look at a page of related text and pick out characters to cut and paste together). 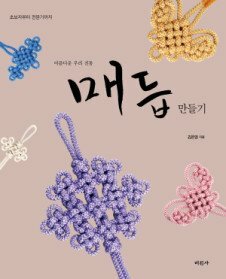 Then I had a look at my copy of Elegant Knotted Jewelry by Becky Meverden and there were double coin knots and romanized Korean: "nalgae". Sounded plausible. Sounded familiar... Checking out my maedup translation grid we see nalgae is the name of the sauvastika knot. It's a wing knot, but it's a dragonfly wing, not a butterfly wing. *sigh* A search of Google Images bears that out. On the flip side, a search for nalgae brings us to Sarah's blog where she ties the double coin knot calling it the nalgae maedeup because she's using Becky's book. *sigh* But Sarah's blog is an excellent find (although either I found it before from a different blog server or there's another expat Canadian with small kids blogging about maedeup in Korea. Possible, I suppose) because she reminds us of Jogakbo and introduces us to Gmarket. Along the way I bump into an online Korean bookseller. Even if you're not interesting in international purchases that where you're kind of blindly filling out forms in a language you can't really read, this site has the excellent habit of putting the whole table of contents on the book listing page. So the table of contents for 매듭 만들기 : 아름다운 우리 전통 and 매듭 and 전통매듭 in wonderfully useful cut and paste-able form. After a brief stop at Beard Papa's for an eclair with banana filling, I walk over to Iwase Books in Yaohan Centre to order はじめての中国結び—伝統技法で作るアクセサリーと生活雑貨 . Since I'm on a roll, I order 図解 はじめての飾り結び and 図解 初めての飾り結び 2 too. I'm only mildly interested in them, it's the first one I want. When I get there, I discover that they've moved the craft section to the other side of the shelf it usually lives on and they've lost almost all of the bead books. This makes me sad but doesn't interfere with the rest of the plan. 6-8 weeks says the lady after taking a deposit since I opted for boat versus plane. So, I'm a bit down about the delayed gratification, extreme edition, when the phone rings. It's Iwase saying that they can't get the book I was most interested in. Sadness. Do I order direct from Amazon Japan? Do I hang any hope on the "we don't think..."? 초보자부터 전문가까지 아름다운 우리 전통 매듭 만들기 우리나라의 매듭은 손끝에서 손끝으로 이어져 내려온 민속공예로 그 사용 범위는 일상생활의 구석구석까지 미치지 않는 데가 없을 정도였다. 이 책은 서울시 무형문화재 매듭장 김은영 선생님이 전통 매듭의 대중화를 위해 쓴 책이다. 매듭에 관심이 있는 사람이라면 누구나 쉽고 재미있게 배울 수 있도록 매듭의 역사와 쓰임새는 물론 35가지에 이르는 다양한 종류의 매듭 맺는 과정을 컬러사진과 친절한 설명, 이해를 돕는 삽화를 통해 소개한다. 더불어 매듭을 응용한 장신구와 생활소품 도안까지 포함하여 생활 주변을 전통 매듭으로 아름답게 꾸밀 수 있을 것이다.